I spotted this article over at Yahoo and felt it necessary to share it with my readers. I'm pretty a lot of people are wondering why is it that a state such as Iowa plays such an influential role in electing Presidential nominees. Well, I think the people over at ABC News did a very decent job in explaining why. 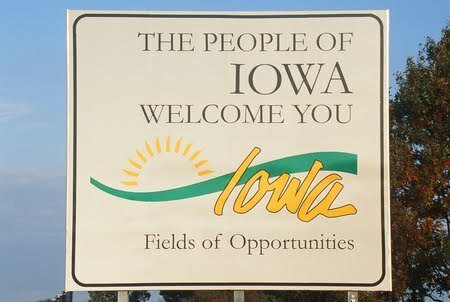 "It's all Iowa all the time because, at its simplest, it is the first official recorded vote of the nominating season," said David Redlawsk, a co-author of "Why Iowa" and a political science professor at Rutgers University. "We are an impatient people, we Americans. We want to know who's going to win." So what is oh-so-important about Iowa, a state that has more bushels of corn than Republican voters? "Tradition!" insists Timothy Hagle, a political science professor at the University of Iowa. The Hawkeye State has held the first votes of the presidential cycle in every contest since 1972, when a change in the Democratic Party rules forced its caucus into January for the first time. That "historical accident," as Redlawsk calls it, is the genesis of the now-sanctified presidential-nominee-picking tradition. But it wasn't until Jimmy Carter successfully used Iowa as a springboard to propel his 1976 campaign from Jimmy who? to President Carter that Iowa solidified its spot at the front of the presidential nominating process. "Iowa is a small state with small media markets," Hagle said. "You can run a fairly inexpensive campaign in Iowa. It gives lesser-known candidates an opportunity to get in the contest where they would not otherwise be able to be competitive if, for example, the process started in a big state like California or Texas." "If you've got a vehicle and a map you can do pretty well for yourself," Hagle added.